Spect is an ultra-light image browser from Panic founder Steven Frank. Spect is in the one-thing-well school, apps that focus on a single task and make that task as easy and fast as possible. And because Spect comes from Panic developer Steven Frank, it does its task very well indeed. So what is Spect? It’s a Mac image browser app that lets you dump folders containing thousands of images onto it, and then speed through them, viewing, culling, selecting and deleting along the way. The Finder is great for viewing images, but it can get bogged down, especially if those photos are on a network drive. To stress test it, I used the free trial version to open up folders of images on an old hard disk drive inside my iMac. Running through JPGs is instant. Tapping the left and right arrows flips to the next photo without delay. When Spect came across RAW DNG files, it slowed a little. Full-screen mode also slowed thing down quite a bit, but my iMac is really, really old. One oddity is that, in full-screen mode, the sidebar showing source folders is hidden. As far as I can tell, the only way to see those folders again is to exit full-screen. Otherwise, navigation is easy. You can view just the top-level images in a folder, or tell the app to dig down into various sub-folder depths, and the keyboard navigation works exactly as you’d expect, with the arrow keys, modifier keys, and space bar all mimicking their Finder functions. 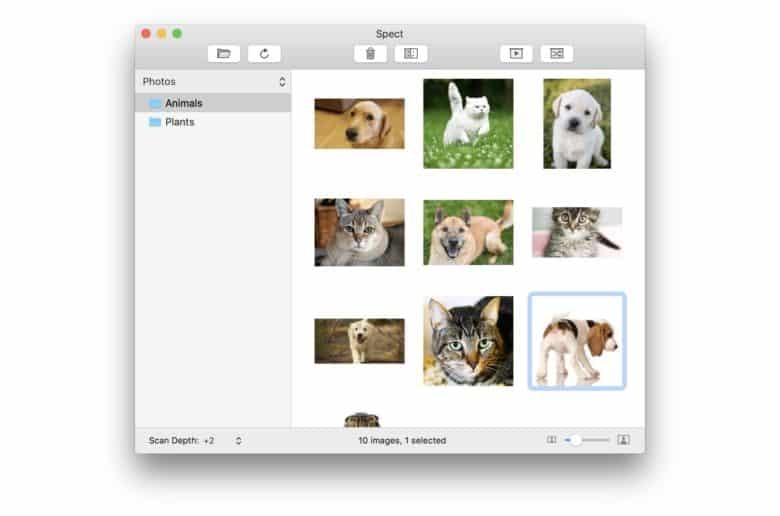 The paid, Mac App Store version of Spect allows you to delete single or multipole images, start a slideshow, reveal the selected image in the Finder, and to shuffle the images. If you regularly deal with folders full of pictures, and don’t like the Finder, or the even-slower Photos app, then check out Spect. It’s just $5.